SSC CGL Exam (Tier I), 2017 was held from 05.08.2017 to 24.08.2017 in the Computer Based Mode. 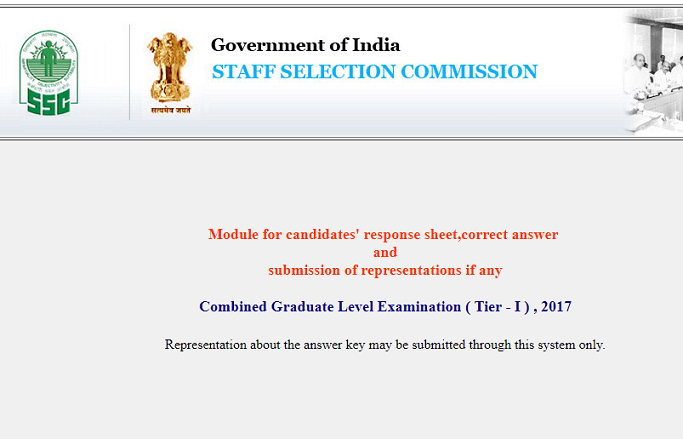 The tentative Answer Keys for SSC CGL 2017 (Tier-I) have been uploaded on the official website of SSC i.e. www.ssc.nic.in. You may login using same USER ID and Password(your DOB) which were used during the Examination and submit representations, if any, from 07.09.2017 (5.00 P.M.) to 12.09.2017 (5.00 P.M.) through on-line method only, on payment of Rs.100/- per answer.